The Hellenic Seaways Highspeed fleet consists of three ferries - Highspeed 4, 5 and 6. The introduction of these vessels has offered a huge advancement and innovation for passenger travelling in the region, decreasing the crossing times by about 50% as well as increasing safety and the onboard experience. Highspeed 4 built in Australia in 2000 has a passenger capacity of 1004 and can hold 188 vehicles in its garages. Highspeed 5 is the newest of the three ships, was built in 2005 and can accommodate 809 passengers and up to 154 vehicles. 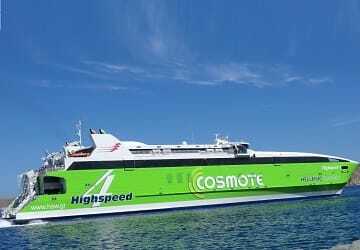 Highspeed 6 is the biggest of the fleet with a 968 passenger capacity and space for 260 vehicles and has previously operated as the Milenium with Trasmediterranea. As these highspeed ships generally operate on shorter crossings, there are no cabin facilities available. Seating can be pre-booked and comes in a choice of Economy, Business and VIP class, depending on the service you are travelling on. Please Note: Whilst we have taken great care in making our Highspeed guide as accurate as possible, onboard facilities, services and entertainment may vary depending on the date and time of year that you travel, facilities mentioned may change without notification and ferry companies reserve the right to operate vessels other than those mentioned at time of booking without prior notification. 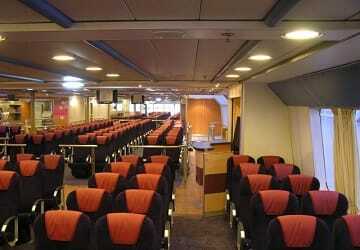 Clean modern highspeed ship.Helpful friendly staff.Left promptly and arrived as scheduled. Was surprised ship was very quiet about a 10% full. was happy with experience. On my very own Eat, Pray, Love trip I decided to wing an element of my Greece travels island to island. Direct Ferries not only was straightforward, fast and efficient. It repeatedly showed the best rates available versus other sites I tried. We traveled on Hellenic seaways from Pieras to Paros. There were 22 of us! The whole trip was very organised, with no delays. 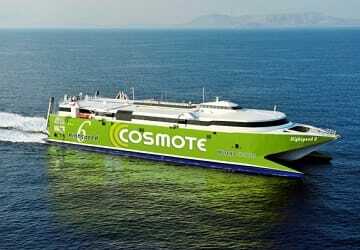 "A company to trust in"
It was a nice experience catching the ferry to and from Heraklion, Crete. The journey was short and sweet. Embarking and descending the ship was extremely quick and easy. The experience on board the vessel was quite pleasant; modern and airy but the only negative aspect was the fact that it was cold due to the air conditioning. Easy booking on-line, good service. Great journey. Perfectly on time, good organisation, great seating (we were in VIP area but normal class looked perfectly fine also). Mediocre pastry, but, being French, we are particularly demanding on the subject. everything went well with the only exception that the ferry was late in both trips from Mykonos - Paros and vice versa. 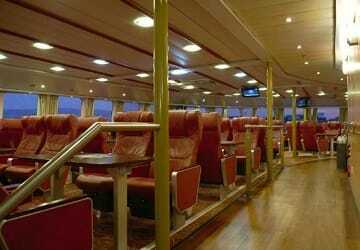 Staff quite competent and standards of the ferry quite high, I definitely recommend it to anyone to travel with it. Yes the ferry was quick and efficient. It was clean and it left on time. Prices were good also. Great, fast ferry from Heraklion to Thira. We were disappointed we couldn't stand on the deck until we realized how fast the ship moved - too fast to stand on deck!! The chairs were very comfortable and the staff helpful and extremely efficient. We were quite impressed at how quickly they managed to get people off and on in Thira. We'll definitely travel this ferry next time. Had a great time on the high speed ferry. We sat in first class which was nice. It was a nice break from busses and taxis.